I have decided to reform the SA Militaria Collectors and Research Society. Membership is open to anyone who has an interest in collecting Militaria. Be it Military medals, badges, swords, bayonets, uniforms, webbing, maps or prints. Pay subs of R50 per year. Attend a meeting in Johannesburg or Pretoria and speak about an item from your collection. If you live too far away, write a few lines about an item in your collection and send me a photograph. The first meeting was held at the War Museum in Johannesburg on the 21st November 2015. We are now looking for another venue. We had a special deal from the Museum. We paid R450 only for the rental of the Delville Wood Room. At R50 subscription, the society would be insolvent before the first meeting. There were 8 people attending. A handmade box presented to Max Nathan Censor in Punjab India – the box made by a Boer prisoner of war. 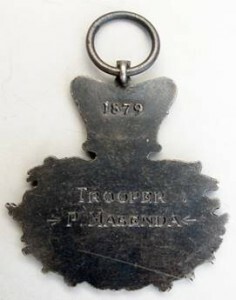 A petrol lighter made from aluminium and Perspex that had a Maria Theresa Thaler fixed to either side – probably made by an Italian prisoner of war. A silver medal inscribed to Tpr P. Mabenda 1879. The piece is struck and not cast – can anyone help with any further information? The second meeting was held in the Tea Garden at Smuts House in Irene on the 19th December 2015. I think that all the Pretoria meetings will be held there in future. A1907 bayonet with the hooked quillion – the hooked quillion was incorporated in the design as an aid to disarming an opponent armed with a bayonet. It was discontinued as unnecessary. Or why bring a knife to a gunfight. A WW I Brody Helmet – the metal helmet was introduced and reduced casualties from shrapnel by 70 %. A pair of binoculars marked to L/Cpl Ransden M.G.C. Three tins featuring the head of General Smuts. The large tin dated 1940 was filled with Cadbury or Bournville chocolate. A book by R.J. Yell about the South African gifts and comforts fund. The next meeting will be held at the tearoom at Smuts house on Saturday Afternoon at 2.30 on the 20th of February 2016. The meeting was opened by the chairman Mr A. Nel. A vote of thanks for the venue was proposed and accepted by the meeting. We are very grateful to the O.C. Lt Col H. Jansen for putting the facilities of the regiment at the disposal of the Society. There were seven members present. Our photographer Mark Smith has provided photos of the items show cased. A controversial booklet “What really happened at Rokes Drift” was show cased. The book by Pat Rundgren is well researched and ask some searching questions about the defence of Rokes Drift. For those of you who have an interest please contact the secretary to obtain a copy. A wooden money box made by a carpenter during WW2 was then show cased. Some shoulder titles/slouch hat badges of the I.L.H. were show cased. The QSA , WW1 medal pair to C.Lowe of HMS Sappho was then show cased. The shoulder title and collar badges of the Karoo Schuters were show cased. 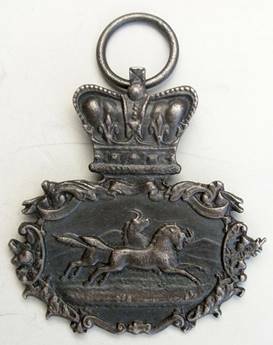 The collar badge feature the ship that was used by the 5 swimmers who escaped from the British during the Anglo Boer war. The chairman then asked everyone to bring a friend to the next meeting. If anyone should require a map to find the venue please let me know. * Photos are available on request: medals@wirelessza.co.za.